Sen. Rand Paul (R-Ky.) said on July 30 that he will vote to confirm conservative Supreme Court nominee Judge Brett Kavanaugh. In the past, Paul has dissented from Senate Republicans on crucial votes and had previously said that he was undecided on Kavanaugh. “After meeting Judge Kavanaugh and reviewing his record, I have decided to support his nomination,” Paul wrote on Twitter. Before announcing his decision, Paul was one of three Republicans considered swing votes on the confirmation. With the Kentucky senator on board, Republicans are inching closer to a confirmation victory in the fall. President Donald Trump nominated Kavanaugh to replace retiring Supreme Court Justice Anthony Kennedy. Republicans consider the confirmation a major legislative priority since Kavanaugh would solidify a conservative majority on the court for years or decades to come. Paul said he was initially uncertain about Kavanaugh due to the judge’s stance on privacy. In a 2015 opinion, the judge argued that warrantless data collection is not a violation of the Fourth Amendment. Congress terminated the program the same year. 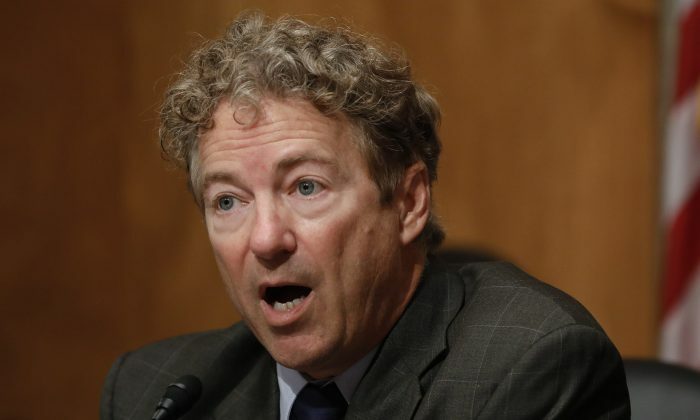 Paul has for years been a vocal critic of government surveillance. Senate Republicans hope to confirm Kavanaugh before the midterm elections but hold a slim 50-49 majority with one senator on sick leave. A single Republican voting against Kavanaugh could derail the nomination. The two remaining Republicans who could swing against Kavanaugh are Sen. Susan Collins (R-Maine) and Sen. Lisa Murkowski (R-Alaska). Both said they oppose the nomination of a judge who would overturn Roe v. Wade, a Supreme Court decision that struck down laws restricting and criminalizing abortion. Three Democrats from states Trump won in 2016 could also swing in favor of Kavanaugh. Heidi Heitkamp (D-N.D.), Joe Donnelly (D-Ind.) and Joe Manchin (D-W.Va.) voted to confirm Trump’s previous nominee to the Supreme Court, Justice Neil Gorsuch. None of the three have indicated how they will vote. Manchin met with Kavanaugh on July 30. Senate Minority Leader Chuck Schumer (D-N.Y.) is leading the effort to block the confirmation. Schumer has focused the battle on obtaining a giant trove of documents that Kavanaugh generated during his work as staff secretary for the White House during the George W. Bush administration and as an attorney on Kenneth Starr’s special counsel probe of then-President Bill Clinton and then-First Lady Hillary Clinton. On July 30, the National Archives released the first tranche of Kavanaugh documents. The paperwork relates mostly to the Starr investigation, which concluded with a report recommending Clinton’s impeachment. The files reflect the scope of Kavanaugh’s work on numerous issues within [the Office of Independent Counsel]’s purview, particularly the investigation of the death of Deputy White House Counsel Vincent Foster,” the National Archives press office said in a statement. Like Gorsuch, Kavanaugh is in his early 50s. Considering that the Supreme Court appointments are confirmed for a lifelong term, the pair could remain on the bench for more than three decades. Liberal Supreme Court Justice Ruth Bader Ginsburg said at a theatre event in New York City on July 29 that she hopes to serve at least five more years on the Supreme Court, CNN reported. At 84, Ginsburg is the oldest judge on the Supreme Court.